Does it look like the trillions squandered on senseless wars that kill innocents by the hundreds of thousands? Can it be seen on the face of any of the millions of humans who starve to death annually while a handful of individuals are wealthy enough to feed the world countless times over? To help visualize this injustice, we could look at graphic images of human suffering. But rather than do this and get all depressed, we’ll instead look to some colored graphs and visual representations of statistics… yay! This will help us get a broader picture of the world’s injustice, which may, in turn, help expose us to the root factors perpetuating injustices in the world. 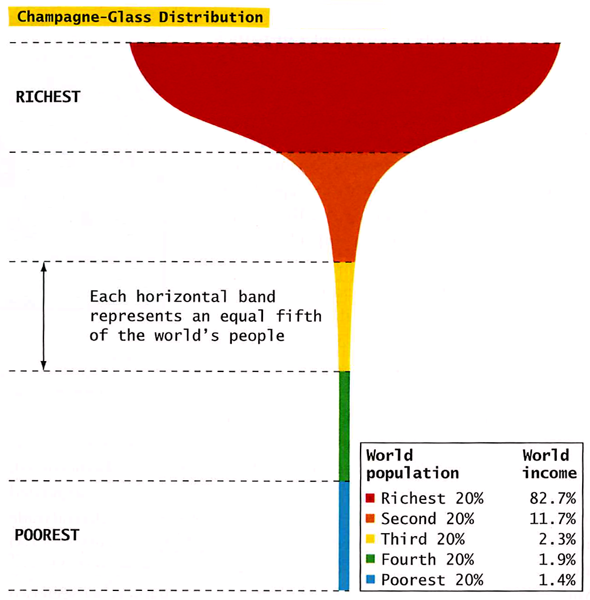 As you can see, most of the wealth (and therefore power) concentrates with earth’s top tier. 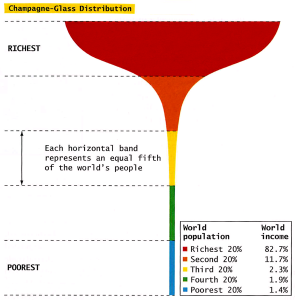 The third, forth, and fifth tiers, while forming 60% of the world’s people, have to survive on about 6% of the world’s wealth. From these bottom tiers comes the millions who die every year from starvation or easily treatable diseases. Wealth within a nation is divided much like it is for the world: most of it concentrates into the hands of those at the top. To see how the internal distribution of wealth compares between nations, we can look to the Gini Coefficient which highlights the gap between the rich and the poor. 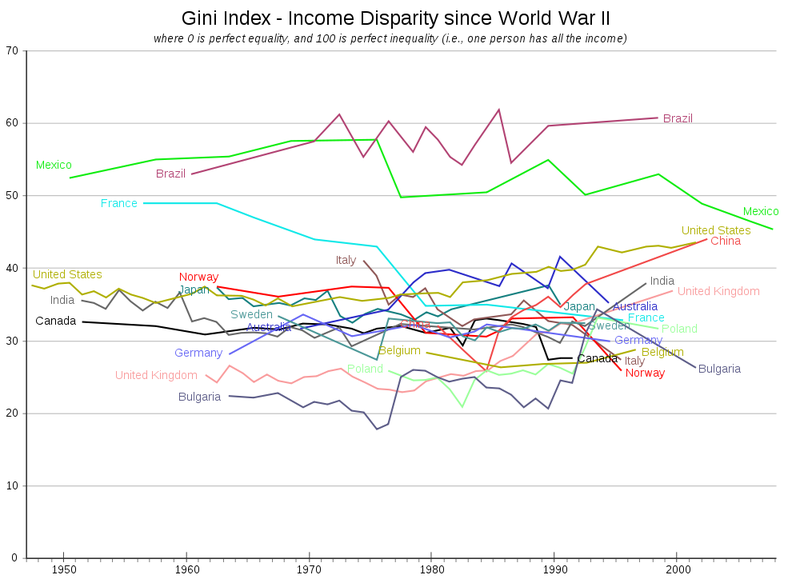 The greater the Gini value, the greater the economic inequality. 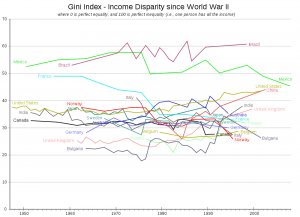 Note how the Gini for several of the wealthiest countries, like US, China, India and the UK, have been on the rise, supporting the reality that the rich are indeed growing richer. 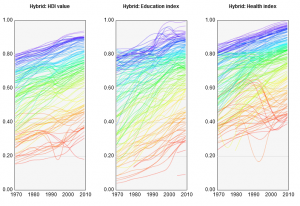 There’s nothing like side-by-side comparisons of brightly colored maps to help us spot the big trends. Studying these maps it’s possible to see a running theme: nations where the citizens are free, enjoy a higher quality of life and receive a bigger piece of the economic pie tend have a happier, more peaceful population. This next graph isn’t bright or colored, but it’s somber appearance is fitting for what it represents: America’s war budget for the past 50 years. It’s such a bloody tragedy that one of our world’s foremost superpowers chooses to invest large amounts of taxpayer dollars into armed conflict. On top of all the lives ruined and treasure squandered, war – by taking away precious resources that could be used to improve the world – remains an injustice of the highest degree. We will go out on a positive note, with what is one of the most optimism-inspiring image of all time. 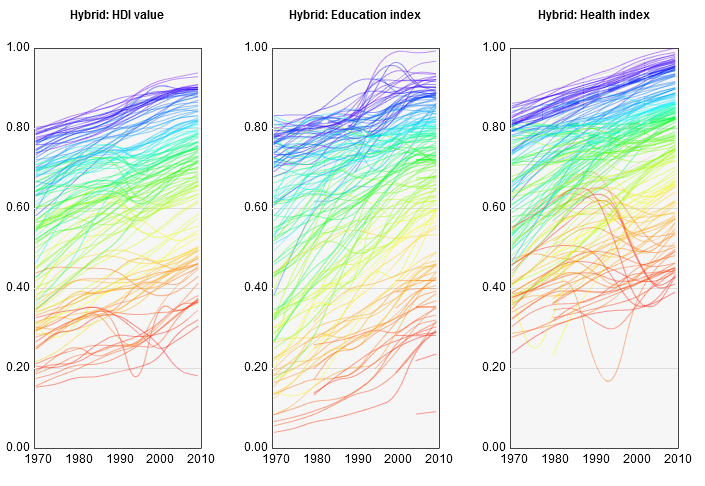 It shows the world’s human development, education and health indicators over the past 40 years. Note consistent upward trend. Isn’t it beautiful? This means that, despite the glaring inequalities of wealth distribution, despite the fact that the richer have been getting richer, the world’s people are still better off than ever before! This shows us how much we are improving as a species and how we grow more empowered everyday, and this only just the beginning. New technologies, discoveries and developments will mean that, even though most of the world may have to contend with sharing the same small slice, the size of the entire pie has been growing. Soon, if we aren’t already, we’ll be in a position to meet the basic needs of all the world’s people. When no one is starving, dreams of world peace be much easier to believe possible. A more just human civilization is well within our reach. This entry was posted on Tuesday, January 18th, 2011 at 5:57 pm	and is filed under Main Blog. You can follow any responses to this entry through the RSS 2.0 feed. You can leave a response, or trackback from your own site. Thanks peace builder, for telling it like it is. 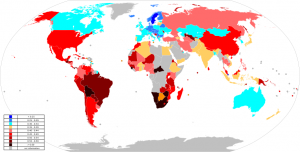 i googled maps of distribution of wealth and got your site. I am glad there are people articulating what they see and what is true. We as westerners have SO much and are blind to it and we complain about it far too often. me included, have mercy! I am trying to do my little part to change the wealth distribution and sensitize people especially kids to what the world really looks like. may i tag your site on my blog? Hey Pat, thanks for the great feedback! Checked out your blog and it looks great. Feel free to tag my site on your blog.